3. Hands out Billions to leftist Agencies that Fund ACORN and other Community Organizing Groups. 4. Increases Dept. of Housing and Urban Development (HUD) Funding after It Helped Cause the Financial Crisis. #1. The national debt will double over the next 5 years; and it will triple over the next 10 years to $17.3 trillion. #2. The national debt will soar over the next 10 years from 40% of GDP today to a shocking 82.4%. #3. Total federal borrowing will grow by $2.7 trillion this year alone, an increase of 27% in 1 year! #4. Increases federal spending by 34% over the previous year, with a total of $4 trillion in federal spending, the highest ever. #7. Includes $1 trillion in tax increases on the upper 5% of income earners, mostly tax rate increases. But the top 5% of income earners (those making over $145,283) already pays 60% of all income taxes. energy tax on the production and use of carbon energy, such as oil, natural gas, and coal. actually represents the troop drawdown in Iraq, which was already scheduled to occur under the Bush administration. is actually an additional tax increase on upper income earners. 1. Taxes. Most government spending is financed by taxes, and high tax rates reduce incentives to work, save, and invest —resulting in a less motivated workforce as well as less business investment in new capital and technology. 2. Incentives. Social spending often reduces incentives for productivity by subsidizing leisure and unemployment. 4. Inefficiencies. Government provision of housing, education, and postal operations are often much less efficient than the private sector. Government also distorts existing health care and education markets by promoting third-party payers, resulting in over-consumption and insensitivity to prices and outcomes. Another example of inefficiency is when politicians earmark highway money for wasteful pork projects rather than expanding highway capacity where it is most needed. AIG donated money to politicians. Politicians facilitated bailout money for AIG. 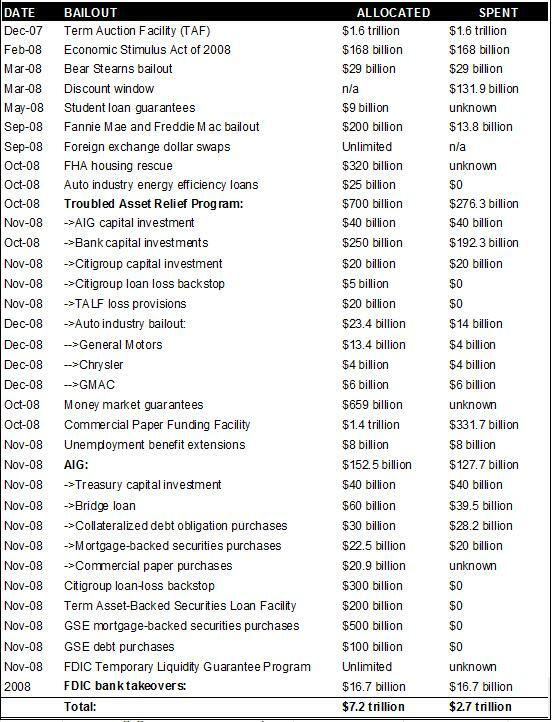 AIG then distributed bailout money to other banks in USA and abroad. Government Printing Office, go to page 404. ReadTheStimulus. Library of Congress (Thomas), select H.R.1.ENR, then DIVISION B, TITLE VII, SEC. 7001(b)(3)(D)(iii). U.S. Senate just approved Obama’s ‘Stimulus’ Bill which will keep us in debt for generations. As if that is not enough, the Senators added Universal Health care in the bill. COJONES back in GOP. Thank you! All Republicans & 11 Democrats voted in a bi-partisan way….against it! MORE GOVERNMENT TAKEOVER – TAXPAYERS WILL HAVE TO PAY FOR IT.